How free is the media in Turkey? 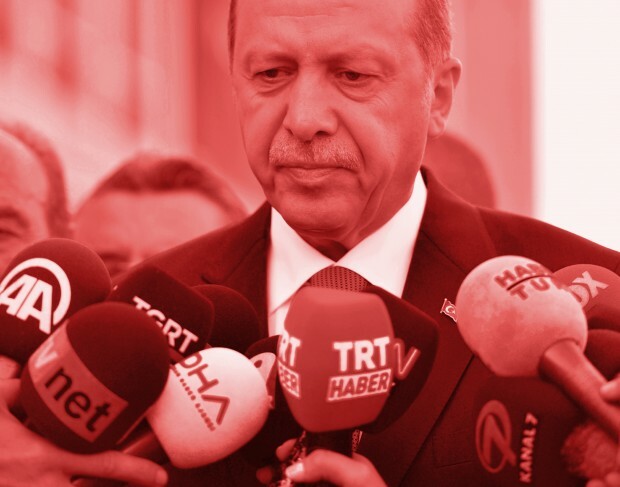 Media freedom has declined considerably during President Recep Tayyip Erdogan’s tenure, and it hasn’t gone unnoticed. A recent report by the EU criticises Erdogan for the country’s “significant backsliding” on freedom of expression. “Ongoing and new criminal cases against journalists, writers or social media users, intimidation of journalists and media outlets as well as the authorities’ actions curtailing freedom of media are of considerable concern,” the report states. Index on Censorship is deeply concerned with the situation in Turkey and participated in an emergency press freedom mission organised by the International Press Institute with a broad coalition of international free expression and media freedom groups before the Turkish elections on 1 November. Our Mapping Media Freedom project, which identifies threats, violations and limitations faced by members of the press throughout the European Union, candidate states and neighbouring countries, has recorded 164 verified incidents in Turkey since May 2014. The country has consistently come top of our list for media violations. The days leading up to and following the election were marred by further crackdowns on press freedoms. Here are just five examples from the last two weeks. The Turkish government arrested two journalists on 3 November over claims they promoted an uprising against the state. Editor-in-chief Cevher Guven and news editor Murat Capan of the left-leaning political weekly Nokta, known for its criticism of the government, face charges after the magazine’s latest issue suggested that the aftermath of the election would spell the beginning of unrest in Turkey. 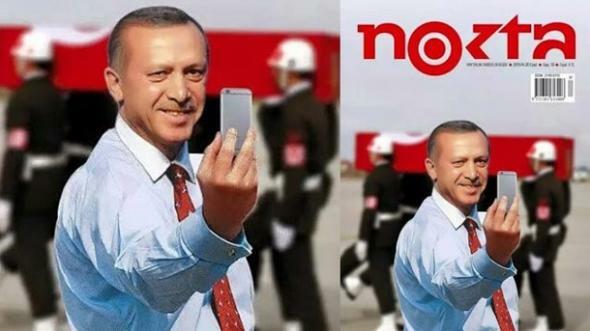 Nokta’s cover featured a doctored selfie of a smiling Erdogan, with the coffin of a soldier – a reference to comments by the president that families of soldiers killed by Kurdish rebels could be happy that their loved ones died as martyrs. The cover hints that the post-election period would signal “the start of Turkey’s civil war”. Nokta has been removed from the shelves and access to its website blocked. Many see the move as further proof of Erdogan’s determination to root out opposition media. Journalists in Turkey don’t just face threats from the authorities, but from Islamist extremists operating the country as well. On 30 October, Mapping Media Freedom reported that Syrian citizen-journalist Ibrahim Abd al-Qader had been murdered in the city of Sanliurfa at the home of fellow Syrian Fares Hammadi. Both were activists in Raqqa Is Being Slaughtered Silently (RBSS), a group of activists using social media to document atrocities committed by Islamic State in Raqqa, Syria, which, since January 2014, has been the capital of the militant group. Both men had been shot in the head and beheaded. ISIS took to social media to boast about the murder, posting a picture of the friends with the caption: “A selfie before being slaughtered silently.” Several suspects were arrested, but are the Turkish authorities really doing enough to protect the rights of journalists? Just a few days ahead of the election, at around 4.45am on 28 October, police with chainsaws smashed through the front doors of Koza İpek Holding and took broadcasters Bugün and Kanaltürk off the air. The incident was captured on live television. After interrupting the broadcasts, riot police arrived and issued a public service announcement on air. Bügun and Kanaltürk then continued to broadcast for several hours, going against the police order. Police then evacuated the editorial offices and attacked journalists. Bugün reporter Kamil Maman was assaulted, taken to a hospital for examination and then arrested. Koza İpek is linked to Fethullah Gulen, a Turkish preacher living in exile in the US. Tensions between Gulen and Erdogan, a former ally, have worsened over recent years. Since the police raid, 71 journalists have been dismissed from İpek Media by a new group of trustees. The media group was unlawfully seized in a government-led police operation in late October which assigned new trustees to the board. Two of the media workers dismissed — Bugün daily news desk editor Bülent Ceyhan and reporter Kamil Maman — say they were forced to go on compulsory leave for several days and are now denied access to the building. On 6 November, a reporter for the independent Turkish press agency Bianet, Beyza Kural, was covering a public protest when police attempted to detain and handcuff her in Beyazit, Istanbul. Students had gathered in front of Istanbul University to protest Erdogan’s control over education. Police officers tried to seize the memory card from Kural’s camera and shouted, “from now on nothing will be like before, we will teach you” — allegedly referring to the election results and Erdogan’s renewed authority. Police officers also assaulted students while firing rubber bullets and teargas to disperse the demonstration. Kural only escaped arrest due to the intervention of fellow journalists and protesters.